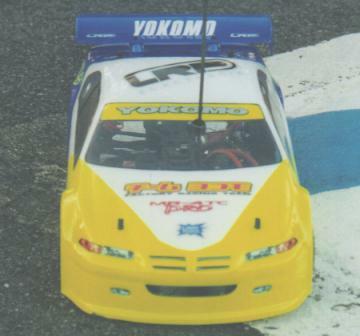 This would be the first race of the carpet season for me, and indeed the first race on carpet with my Yokomo. I had not tested as much as I would have wanted before the race, but in the last week before the race I tried to do as much testing as possible. In the last test before the race I finally found a setup I felt comfortable with and it seemed like the car was pretty fast. So I went into the race quite confident that it would be ok…I would not finish last! On the Friday night before the race I went to the racetrack for some free practice. The track is a high grip carpet track in a small area but still pretty fast. Not that many drivers showed up for free practice so there was no problems getting some practice time. The first pack on Friday night I just tried to re-learn the track (had done a race on exactly that track last winter) and the grip was not very good. For the second pack I did not change anything as I figured that the track would change as more cars went around the track. My MR4TC felt quite good then but I still tried some changes that did feel quite good then (Trinity purple congo front springs different rear link position etc.). I went back to get some sleep before the race and still felt reasonably confident I could have a good race. On Saturday morning everyone was there and then it was difficult to get some practice time. I only managed to get to run one pack so it was good that I went there on Friday. I tried another change (alternative rear link(check the tips for this soon)) then and it felt good but I was a bit concerned that my car did not have enough corner speed. It was then time for the controlled practice and I mounted a new set of tires with some harder inserts. However, after the controlled practice was over I was a bit worried as my best lap was way too slow. So before the first round of qualifying I felt I had to do something dramatic. After a bit of thinking I decided to go back to the setup I had when I came to the race, I even went back to my old tires I had practiced a lot on. So it was time for qualifying and I was a bit worried it would be hard to get used to this setup again now. But the car was really good and I was 6th after that round with a result of 28 laps/5.10. I did make some small mistakes in that round so I knew I could improve as I got used to the setup again. Corally driver Simo Ahoniemi was TQ after the first round. So I did not change anything and in the second round I made a 28/5.05 but I still made two small mistakes. I got up to 5th with that result. In the last round I still had the same setup, just added a bit of camber all round. I was really pushing it in that round and everything went fine ’til the 3-minute mark when I made a bad mistake and lost 4 seconds. I still finished that round with a 28/5.06. So without that mistake I would have been 5th or 6th on the grid I think but now I was down to 8th. Simo stayed in TQ and it looked as though no one would be able to stop him. From 4th onwards it was really close with often just tenths separating the drivers. The finals in the last couple of races have not gone too well for me so I was looking to change that trend here. I wish I could have done that... As my car was really fast now I did not change anything during the finals. The first final I was 8th, so I held my place, but I could have been a lot higher if I had not kept making small mistakes. The second start was great for me and I think I was up to about 4th but then somebody rammed me from behind and I was last. I think this somehow got to me as I was driving like a mad man! I think I did about four laps before I went into the wall and broke my rear shock tower. I did not have a spare one but luckily someone had! So I went into the last A and was looking for a nice clean race. But it did not go that way; I noticed right of the line that something was wrong. It was one of the rear tires that had come loose. I had not noticed it in the pits as the timetable was very tight and I had to find that shocktower and then change it. Simo won the race comfortably and I finished 10th and could not change the trend of bad finals for me. I have to do that next time…. Now over to the positive stuff… I was really happy with my car. My 9x1 LRP Fusion motor was working great I think, really flyin’ and the LRP P3000’s gave me all the runtime I needed and more. My best laptime in the race was 10.37 that I did in the first final and I think the best in the whole race was about 10.1 from Simo Ahoniemi (Corally driver, TC Euro’s #7). So my car was really competitive. My driving was just not as good as it has been sometimes and it should be.